Mt. Cho Oyu, the world's sixth highest mountain at 8,201m, is located west of Mt. Everest along the Nepali-Tibetan border. A straightforward climb and not technically demanding, an excellent mountain for climbers wanting to scale their first 8,000m peak without taking much risk.Our Cho oyu expedition itinerary that begins by driving into Tibet through Kordari, crossing the Himalaya through gorges of Bhote Koshi. The drive is simply awesome!! And full of excitement, we'll arrive on the other side of Himalaya from Kathmandu to Nyalam on the first day. We'll spend our nights in Nyalam relaxing and hiking the hills for acclimatizing. From Nyalam, we begin our overland travel across the plateau and high passes. We'll continue on to Tingri (4,300m) through fantastic plateau scenery with a stop at the Buddhist monastery Milrepa built around a sacred cave. Along the last few miles into Tingri, views of Makalu, Everest, and Cho Oyu remind us why we're here. Tingri itself is made up of old-style mud and stone buildings with an army base at its rear. Tibetan nomads use the town as a base during their stay in this desolate part of the plateau. After arrival at Chinese Base Camp, we'll rest, acclimatize and make the necessary climb preparations before making our ascent to advanced base camp at 5,700m. We'll cross through steep moraines to establish Camp 1 at 6,400m, which should take around 4 - 6 hours depending on weather conditions and how we're feeling. We'll traverse a ridge and ascend a 50m headwall to Camp 2 at 7,000m - a hard day taking 6 - 7 hours. Our strong Sherpas will fix all the ropes as required. 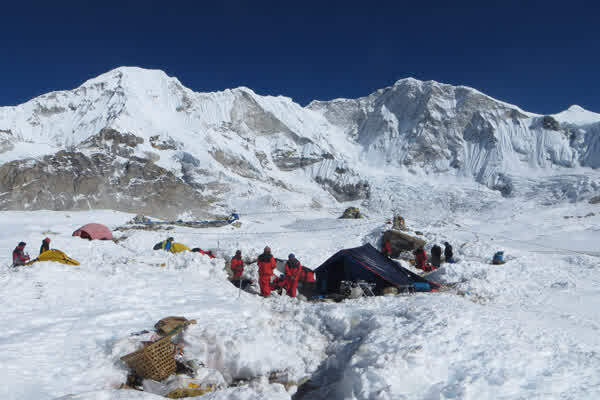 We'll establish Camp 3 at 7,500m on the northwest face, and the following day, set up for the summit. Depending on fitness, we'll be moving up and down the mountain several times, acclimatizing and stocking the higher camps. It will require an extra push to reach the true summit Cho oyu peak on the far end of the high snowfield. Summit day, though long and arduous, will be well worth it when the highest peaks in the world are in view. Previous mountaineering experience is required to at least 6000m. You will also need to be very determined. 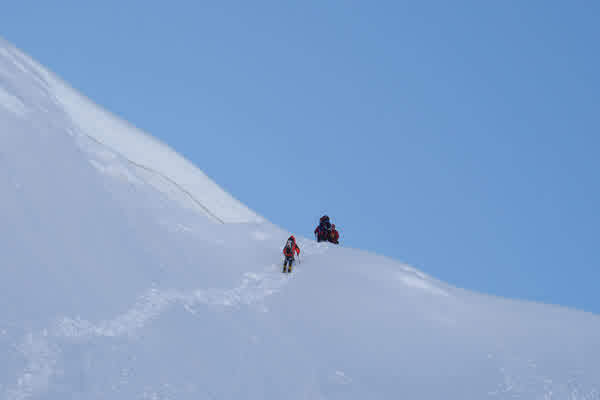 Cho Oyu is a non-technical peak with the possibility of a ski descent for VERY strong skiers. Ski touring in the area near ABC is also possible (and a fun way to acclimatize).To succeed you will need to be extremely fit and have a high level of endurance. You don't need to be fast but you need to be steady and strong. Mental toughness plays a large role as does the ability to relax and let your body acclimatize. Autumn season (Sept-Nov): being the best season for climbing Mt. Cho-Oyu, offers excellent weather and tantalizing mountain views, and also the best season for peak climbing. Summer months (June-September): of the year which coincides with monsoon begins in mid-June and drains in mid-September making travel wet and warm. The mountain views may not be at their best as rain clouds and haze overhang the mountains occasionally obscuring the enchanting views. These times are blessed for the keen botanist as the higher valleys and meadows blossom with flowers and lush vegetation. 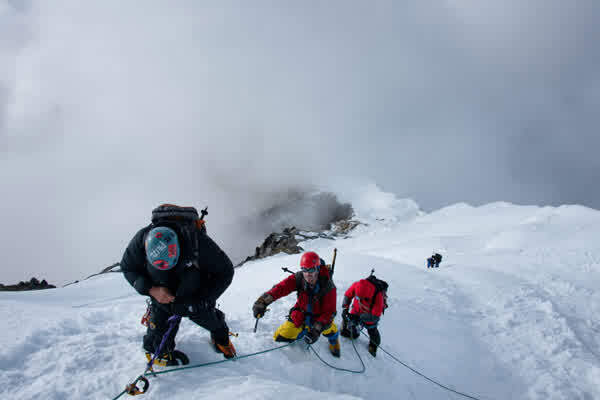 Spring season (March-May): is the expedition season and the best time for climbing the high peaks. It is mildly warm at lower elevations but occasional haze mars the beautiful view of mountains. At higher elevations over 4,000 meters, the mountain views are excellent and the temperature is quite moderate even at night. Winter season (December-February) is noted for cold weather with occasional snowfall at higher elevations. Again, excellent views are common. These months are popular and ideal for trekking for those who are well equipped or who remain at lower elevations below 3,000 meters. Most of the hotel owners will come to the lower altitude cities like Kathmandu and Pokhara. Necessary climbing hardware gears with fixed ropes, snow bars etc. 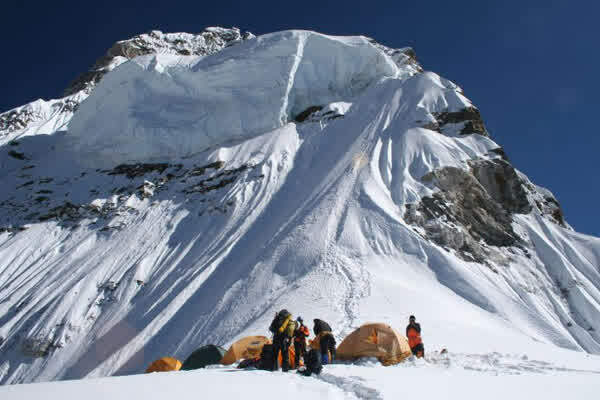 If you prefer to climb with personal Sherpa support, US$ 2500 is the additional cost. The group should enter and exit from the border at same time, in case of early departure from base camp due to personal reason, emergency evacuation or any other reason, the cost of jeep should be paid by client himself or herself. Expedition member’s personal baggage allowed is maximum of 40 KG either from BC to ABC or ABC to BC; if the personal baggage is excess than 40 KGS then extra amount is levied. There is no individual visa for the Tourist group. We will obtain a group visa for the entire team. If any expedition member needs to be early departure from base camp due any reason then he/she should pay Chinese currency 165/$35 at the Chinese immigration atthe order to cancel his/her name from the visa list and US$ 150/- will be charged for transportation from border to Kathmandu. Can I really climb a mountain? Do I need to have climbing experience? How can I climb Mount Everest? Can I climb the seven summits? The level of experience and skills required depends on your particular goal (search for your adventure here). We suggest that people undertaking a first climb should have had at least overnight trekking experience. For those who wish to take on a technically difficult, remote or extreme altitude mountain we'd expect participants to have appropriate experience and skills. Some ideas for preparing for climbing goals are given at the bottom of this page. Why go on a guided expedition? There are many reasons that might make a guided expedition attractive even for experienced climbers. These include someone else taking care of all those details (including thing as diverse as booking and confirming hotels, checking the number of evening snacks, ensuring reliable support, transport, permits, visas, team members, gear, etc. ). This saves your time and energy for the part that really matters - working on achieving your goal. The high levels of support and experience aim to give you the best possible opportunity to succeed, a high level of risk management, and the Alfresco Adventure leaders and staff are there for YOU! What type of people comes along? Climbing expeditions usually attract people in their twenties to fifties. Participants tend to be seeking a good quality, safe, well supported, good value and enjoyable adventure rather than the lowest cost. How fit do I need to be? Will I have to carry a lot of weight? Should I be able to do 100 chin ups? The fitter you are, the more fun you (and your companions) will have. You will find guidance on preparing for your expedition on each adventure's web page (search here), our info packs and trip dossiers. A minimum level of fitness would have you being able to walk all day on uneven, hilly ground, carrying your day pack, and be able to get up again the next day. Many climbs will require a higher level of fitness and strength so you can carry heavy gear to high camps and really exert yourself on summit day. Food arrangements are specific to each adventure, but you get three meals a day while on the track. In cities included is breakfast and, depending on the trip and the nature of the activities may also cater for lunch and dinner for the group. In the Himalayas the kitchen staffs have been training for years and work magic over gas or kero stoves in their kitchen tent. While trekking the cooks prepare a varied menu of wholesome, tasty and plentiful food using fresh ingredients where possible. A trekking breakfast in the Himalayas usually includes cooked foods e.g. eggs, tomatoes, cereal or porridge, toast & spreads and fruit and a selection of hot drinks. Lunch is often soup and a packed lunch, or a cooked lunch. Dinners are generally soup, a main meal (one of many Asian or European style dishes) veges, and a dessert (fruit to custard to baked apple pie!) Drinking water: will be provided at camps (collected with care, filtered, treated with chemicals and/or boiled), and at lunch time where possible. It is wise to carry a small amount of purifying chemicals (e.g. Iodine or chlorine) with you, in case you happen to need water at an odd time. In the developing world care should be taken to avoid untreated water and potentially contaminated foods like uncooked salads and some fruit. Bottled water is available in cities, but of course you can treat tap water in your own bottle too. On the hill we eat easy to prepare food, often prepared by the team with assistance from guides and staff: freeze-dried foods, crackers, soups, snacks etc. On big mountains it is often a challenge to eat, so we provide foods to tempt your appetite and give you sustenance. Who will be responsible for my safety? The short answer - you! All participants are expected to behave in a responsible manner, taking due care of themselves and others. Your expedition leader is responsible for the group including participants and staff. He or she will advise, manage and assist everyone, sometimes with the support of an expedition first aider or doctor, and will be assisted by guides, Sherpas, and you and your climbing colleagues, all of whom will have roles to play. Despite the best precautions, people do sometimes fall ill, sprain something or develop symptoms of AMS. Our expedition leaders will manage your care keeping in mind what's best for you and the rest of the group. Precautions include first aid qualifications and kits, emergency communications, evacuation plans, your travel insurance cover and our pre-preparation and medical advisors. AMS Acute Mountain Sickness (or altitude sickness) is the body reacting to the stress of high altitude. It is a concern for trekkers in the Himalayas and elsewhere above about approximately; say (is that enough vagueness!) 3,000m. Exposure to high altitude can lead to a number of 'normal' physiological reactions as well as mild to extremely serious illness and even death. The treks are designed with relatively slow acclimatization schedules, rest days and alternative options. And there are medications and a number of management strategies in place should they be required. Don't be unduly concerned, but please talk to us if you have questions. I don't have much time, can't we do it quicker? The adventures are designed around what we feel is the optimum itinerary, which incorporates adequate time for the suitably fit participant to do the climb comfortably; flexibility for weather, illness, unforeseen delays; time to enjoy the experience, your climbing colleagues and staff; learn about your surroundings if you wish; and, for altitude adventures, a fairly slow acclimatization regime to minimize the risk of altitude sickness and maximize your chance of reaching your goals. All while also trying to minimize your time away from home. 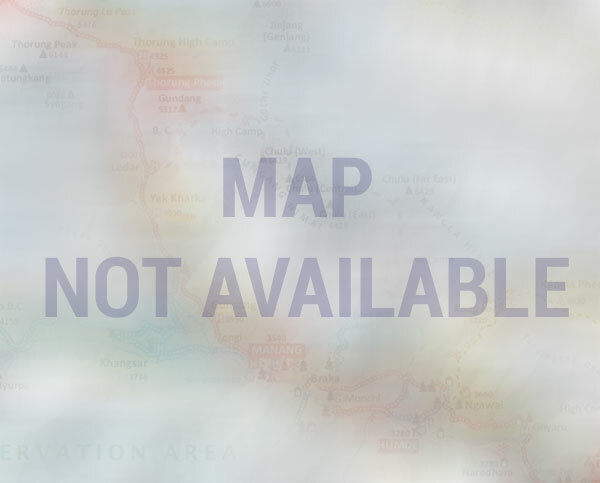 We would generally not recommend shorter itineraries (such as those used by less scrupulous operators) unless you were genuinely prepared to turn back if you (or your travel companion) becomes affected by AMS. If you really don't have the time available, we can perhaps suggest an alternative itinerary or goal that will work for you. My friend would like to visit, but isn't really interested in climbing? Your friend, spouse, family, colleagues may like to join you on the trekking phases of the expedition, and could stay in Base Camp or Advanced Base Camp, depending on the trip, when you are on the hill. If they want to accompany you to our base city (e.g. Kathmandu) we can easily arrange extra accommodation, and places on our day tours, but we may also be able to arrange a series of day trips, a short relaxing trip into the country-side, scenic flights above the Himalayas, wildlife safaris and so on. Ask us for ideas, or suggest your own.